Laundry is an integral part of our day-to-day life! Some tackle it everyday, and some once a week. Nevertheless, the laundry costs can quickly add up given the expensive detergents that are sold in the market. Apart from paying a huge portion of our earnings towards cleaning stuff, we don’t know what we let into our septic systems. Certainly not anything eco friendly. The thing is, even though I make sure to read the labels, most of the ingredients are either something that I can’t understand. And most of the commercial detergents have ingredients that they don’t even disclose. So I wanted to make sure that I use eco-friendly ingredients in my laundry detergent. I made various attempts to do so. But there was some kind of obstacle in implementing those recipes – some related to cost (yes I want to be frugal, yet effective), and some related to the ease of making the detergent itself. If it takes too much time to make a homemade laundry detergent, I’m sure over the time my zeal for making a frugal and eco-friendly homemade detergent will fade off. So I had to find the right balance – I had to make it almost eco-friendly. I’ve not listed the ingredients in any units (measurement) – with this you can choose your own unit of measurement and scale accordingly. I usually make this in batches, so my 1 part = 3 cups. Yours could be the same or different. Have all the ingredients ready. Grate the washing soap using a hand grater. Some do it on a food processor, but I personally find that messy. If you are going to use a food processor, make sure you have a big towel to cover the processor while you run it, and then wait for a while after you open it for the dust to settle down. It is not fun to inhale soap powder. If using a hand grater, go for the fine holes and grate your soap. Take a plastic container – the size depends on how big your batch is – and put your grated soap into it. Now take two parts of washing soda and add it in. Add one part of baking soda and add it to the mix too. Close the container and give the ingredients a good mix. I do it by giving the container a rotating motion while turning it upside down at the same time. You can do it slowly. You don’t have to be aggressive. Let the dust settle (we’ll need to open the container). While that’s happening, take a small jar and add in the required about of coarse sea salt. Add a few drops of your favourite essential oil. If you add 1 cup of salt, you will need about 16 drops of essential oil. Now you have to do the same exercise to give the salt and oil a mix – rotate the jar while you turn in upside down at the same time. Now open both the containers, and add in the scented salt into the other mix and mix well with the ladle. Now transfer your homemade laundry detergent to a jar of your choice! 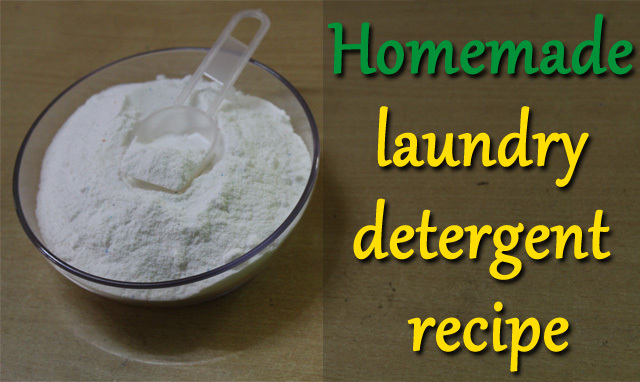 How to use your home made laundry detergent? Just use one or two scoops for a full load. This is a low sudsing recipe so you can safely use it for HE washing machines. If your laundry is super dirty you might want to add another scoop to the load. Nevertheless, consult your washing machine manual or the company staff about using this detergent, if you are in doubt. After the wash cycle you can optionally add in about 1/2 cup of vinegar in the rinse cycle just to make your clothes feel good on you. What’s the big deal about making your own DIY laundry detergent? So while you can get a pack of laundry detergent in the nearest shop, why should you take effort to make one? It saves me money. As I said, I love being frugal, saving as much as I can when possible. This recipe helps me save a lot as opposed to buying pre-packed, non eco-friendly laundry detergent. With this recipe I can contribute an “almost” eco-friendly waste to septic system. And an additional reason is this – I love doing this. Helps me to relax, and switch off from my regular schedule once in a while! So, try this homemade laundry detergent recipe and let me know the results you get.